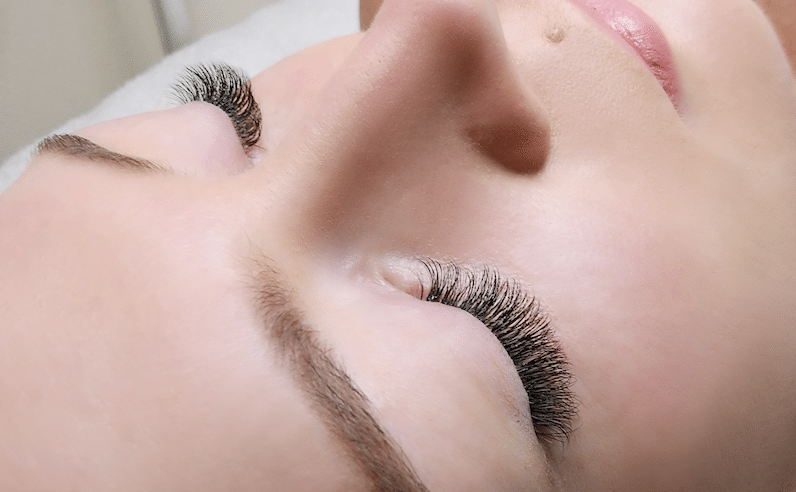 Looking for the BEST eyelash extension training online? 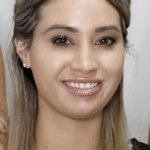 Asena eyelash online training include tips and tricks, techniques, and step by step methods How-to do eyelash extensions properly. After enrolling, you’ll get full access to tutorial videos containing useful information and knowledge and start learning straight away. It’s All waiting for you NOW. After Completing the course, you’ll receive a certificate. 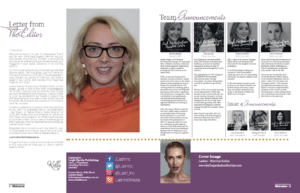 Having this certificate can help you to achieve the status of a professional lash artist. It will serve as a testimony to your dedication, commitment, and passion to learn the skills of eyelash extension. 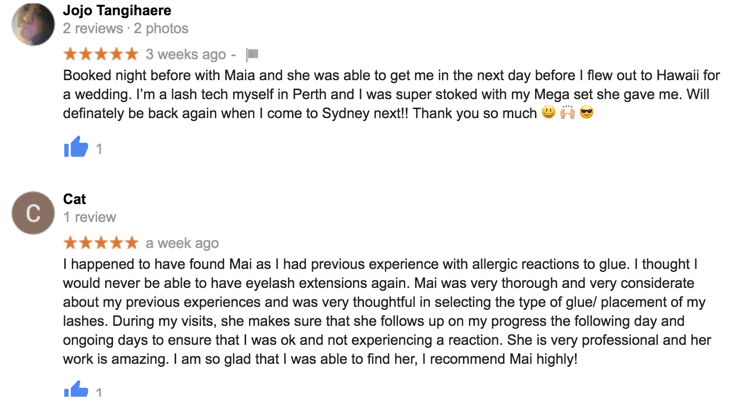 You will get to meet like-minded people, who have the same passion as you to learn eyelash extension skills. You’ll get support and feedback from us and other students across the world. This will help you to learn faster and spend less time searching for new ideas. 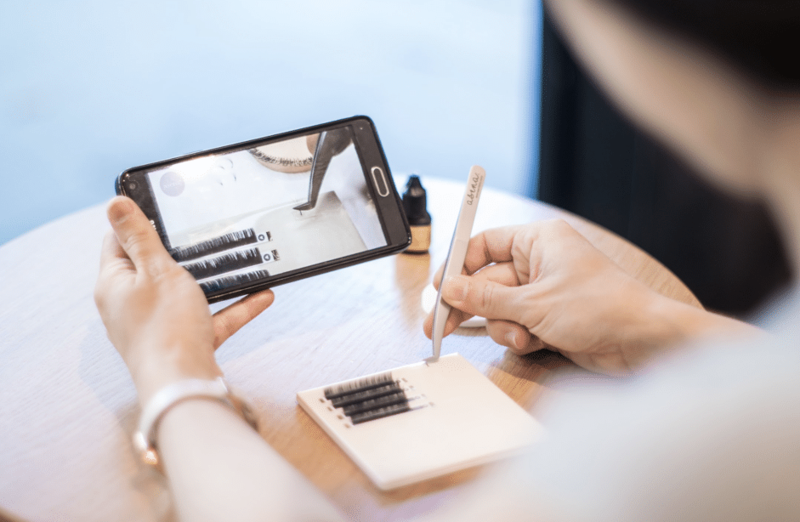 You can also share your interesting ideas and tricks that you have learnt for eyelash extension. Our Lash Study room is an online library where we’ll update the content that related to eyelash extensions and marketing. You’ll get to learn anything and everything you need to know to improve your skill and knowledge outside your courses for free of charge and for life time access. How to win more love from your clients with the most comprehensive online lash course ever. 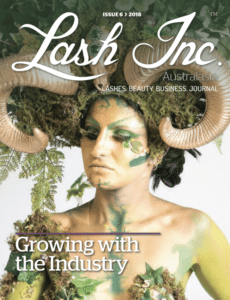 The art of eyelash extensions that will help you to grow your eyelash business. How to advertise, promote your business and make it successful. My students get clients, make money and are living the life of their dreams. Whatever course you choose, you can rest assured you‘ll gain expert guidance. 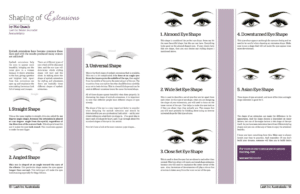 Set out in an easy to understand step by step structure and with loads of tips, tricks, techniques and knowledge that you can use to implement right away into your lash business. that people will happily pay for. to create a natural look that your clients will love. special events like weddings, engagements, birthdays and parties. and how to set up your business and make it successful. While other lash educator talk the talk, I’ve walked the walk. 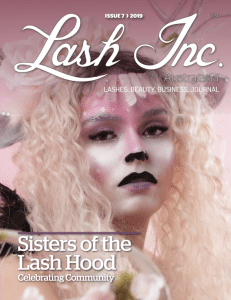 I am a professional lash artist, lash educator and senior journalist for Lash Inc Magazine. My background includes serving as a flight attendant for a 5 star airline. However, my passion to learn the skill of eyelash extension brought me to this industry. 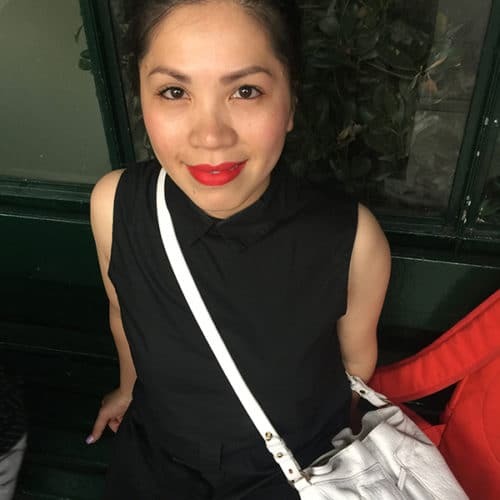 I graduated from ITEC and CIDESCO, international beauty therapy association, and now I am an authorized licensed to teach eyelash extension. I love passing my knowledge and techniques to budding lash artists across the world to make their lash journey an easier one. I have noticed that some of the lash artists still lack the required skills and still struggling and no confidence to be best in their job, this is why I decided to create my own online eyelash extension training courses to help solve their problems. My courses can help you stand out among the crowd and create your own identity in the lash industry. My focus is on quality rather than quantity; So, my video tutorials and guides contain material, which is applicable and practical in real life. 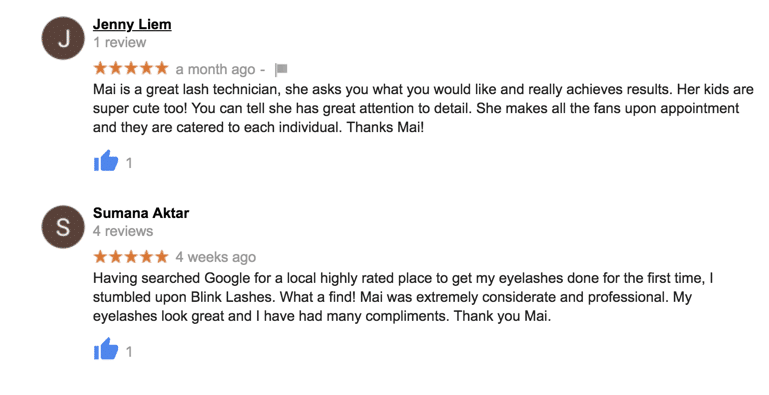 Studying eyelash extensions with Mai allowed me to stop working full time as an employee. I started to build my lash business from home and now I have regular clients which fill my schedule 4 days/ week. I earn more money working on my lash business than when I worked 9-5. I was absolutely happy with the training that she provided. She was very knowledgable and I have learnt so much from her. Mai was able to answer all the questions I had. I would highly recommend this course! Thank you Mai! Mai’s training was excellent and she is such a pleasure to learn from. She is patient with her teaching and very knowledable. Her kind nature made me feel very comfortable. I couldn’t be happier with the results from, today and look forward to the growth. Thank you Mai! I enrolled in Mega Volume Course in Oct 2017. 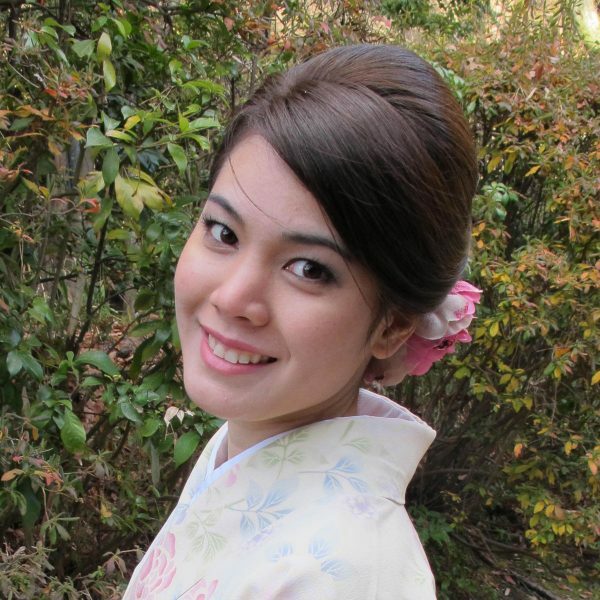 Mai is an incredible trainer as the training provided was in-depth, thorough, and meticulous. She is patient and genuine which gave me confidence in providing flawless sets. My overall experience with Mai was engaging and delightful. I have done mega volume course with Mai from Asena. I love everything about the course. The technique is easy which allow me to do the mega volume set within 2 hours. The tips and tricks that she taught me during the course were extremely helpful. I could adapt those techniques and used them for Classic and Russian volume. Triple win for me Thank you for your awesome training, highly recommend!!!! I’d like to say I really appreciate your time and effort in training me with Mega Volume Technique. I was impressed with your ability to show me all the necessary tips and tricks to get that perfect volume set. I loved that you were able to train me in a way that I could easily understand and put learnings into practice immediately. 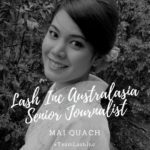 Often with time constraints on learning new lash techniques its hard to grasp it all but because Mai jumped right in to the practical side it was more beneficial for my learning style. I would recommend this course to any fellow lash stylists who want to evolve in the Volume Lash World. Thank you Mai. How​ ​long​ ​do I​ ​get access​ ​to your ​​online lash course? You’ll have life-time access to our online lash course once you enrol. We’ll keep updating course’s contents and materials. You’re invited to view our courses any time you want to enhance and refresh your knowledge and skill free of charge. I have never done lashes before. Can I do the Volume Lash Training Online? 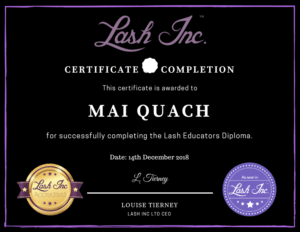 Will I receive a certificate after the completion of my eyelash extension training certification? You’ll receive a certificate of completion after you’ve successfully completed the lash course.  You can also get the opportunity to earn Asena BadgesⓇ. This type of badges is only issued to students who pass the case studies with a required score. Contact us for more information on how to earn Asena BadgesⓇ. Yes. The course is divided into modules, and you’ll get full access to your course after 14 days trial period. You’ll get life time access to your course content at anytime from anywhere. Whether it’s 2am or 10pm, you can just log in to your member home and start learning. Are you offering in person eyelash extension training course? Yes, in person eyelash extension training course is offered. However, it is currently being offered in Australia only, please contact us for more info about the in person course. Mega volume is an advance volume course. 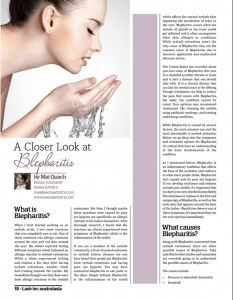 So, it’s recommended to master classic lash and volume lash before opting for mega volume course. I update the course contents regularly which means you’ll constantly learning new things all the time. And because you have life time access to the course, you get ongoing access to all updated contents. Yes the course is fully responsive and accessible on all devices. So can get access from anywhere at anytime. How do I access to the course contents? After the payment has been approved, you can use the username and password that you chose during check out to log in to your student dashboard. You can go here to Log In. 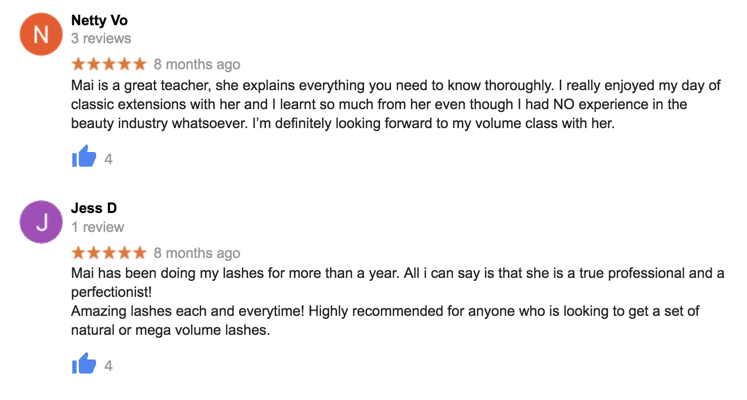 How is your online eyelash extensions training courses different to other lash courses? I’m an experienced lash educator who teach my students from my 8years+ experienced. I go the extra mile and provide other resources for you to use in your lash business. I’m passionate about lashes and business and still lashing my clients everyday. The course is a fully comprehensive which provide you a solid foundation of knowledge and practicals that you can refer to for as long as you want. 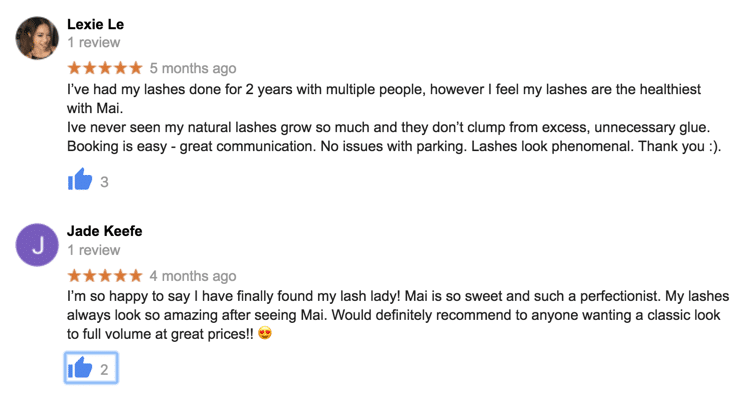 Unlike many other online lash courses, You won’t be alone along your lash journey. You’ll always get support via email or mentoring call. And unlike other online lash courses, I teach from my passion, So I set the price of the courses for everyone to be able to afford it. My main focus is to help my students to be successful in lashing career, not to make money from them. 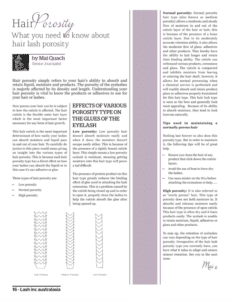 What kinds of people suitable to enrol in the online eyelash extensions courses ? All my online courses are suitable for any beginners who want to learn how to lash and make a living from it. 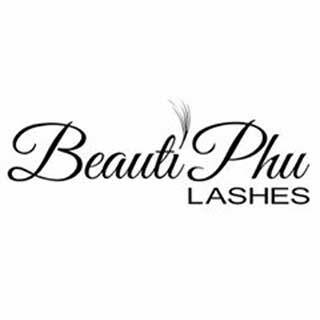 Or any experienced lash artists who want to improve lashing skill and be the best in your area. 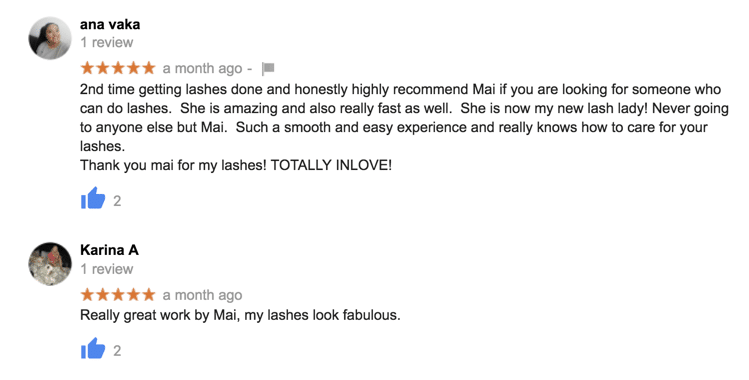 Be a successful professional lash artist. What is the price of the courses? 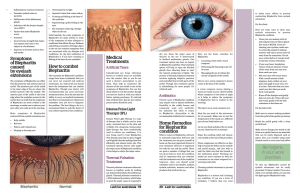 We offer 4 online eyelash training courses and a social media marketing subcription. The price of each course is different. Go here for more information on each course. Note: The course prices are in USD currency. We offer full payment method, which will give you instant access to all the content and material of the course. We also offer an installment plan. In this plan, payment will be deducted from your credit card every week. After we have received your installment, your course’s content will be scheduled and delivered every week for 8 weeks. If you’ve worked through a few modules of the your course during 14 days trial period and haven’t gained any value from it (or just don’t think the course is for you), I’m more than happy to refund your full trial payment. Please keep in mind… No refunds are provided after the 14 days trial period, and I don’t provide pro-rata refunds for cancelled accounts. After the initial refund period expires, I’ll continue to process any remaining payments (if you have selected an installment plan option).